The white line that is often seen on rocky portions of the shoreline has long presented a mystery to me. What is it made of? As the waterlevel changes, what turns its formation off and on? Why does it appear some places and not others? That such matters have intrigued me for some time is evidenced by the picture on the right taken seven years ago. For the longest time, I thought that the line was biological in origin and sought answers from that community. It wasn’t until I encountered Rick Nordin, a retired limnologist from the University of Victoria, that I learned the basic answer: CaCO3. Calcium carbonate (CaCO3) is a common substance found in rocks in all parts of the world, and is the main component of shells of marine organisms, snails, coal balls, pearls, and eggshells. Calcium carbonate is the active ingredient in agricultural lime, and is usually the principal cause of hard water. It is commonly used medicinally as a calcium supplement or as an antacid (Wikipedia). CaCO3 in a lake is brought in by streams, by groundwater seepage, and by the leaching of the lakeside soil during high water. In some lakes (called marl lakes), the concentration of CaCO3 can become so great that it will crystallize as a whitish precipitate in the deep water. 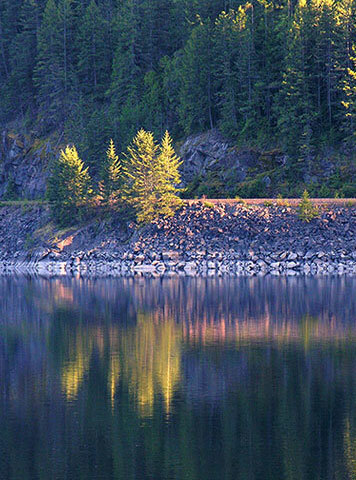 A provincial marl example is Kalamalka Lake. The formation of that precipitate depends upon the solubility of CaCO3 which, in turn, depends upon things such as the temperature and pH of the water, and the amount of CO2 in the atmosphere. 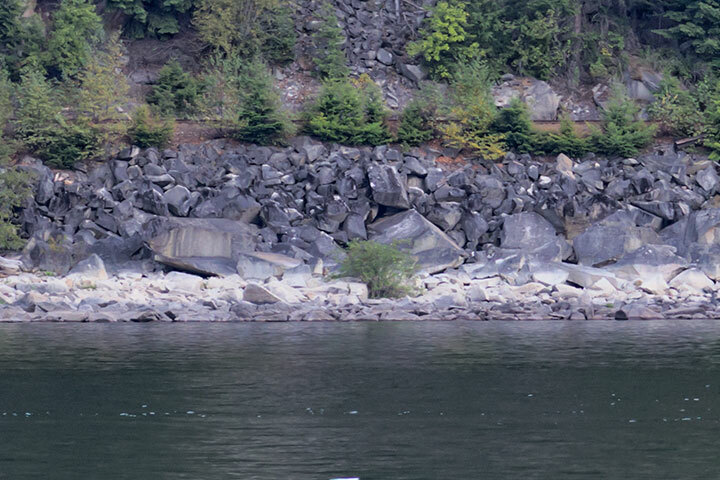 In Kootenay Lake, where concentrations are lower, these things may influence how CaCO3 dissolves in the water, but they seem to have little influence over the formation of the white line, itself. The white line around Kootenay Lake seems to be caused during high water when the concentration of CaCO3 is greatest. Yet, it does not form below the Lake’s surface, but above it. The deposit seems to come about as waves wash up and repeatedly wet the lakeshore. Some of this water evaporates and, as it does so, the concentration of CaCO3 increases until all that is left is a deposite coating the surface. Each wave adds to the deposit. While the white line is readily seen on rock bluffs, the calcium carbonate is also found on any of the wave-wetted surfaces, such as pilings and willow bushes. The rock bluff across from Nelson is one of the many places which displays the white line. There is a well defined top set approximately by the height of the high water. The reason for the cutoff at the bottom is less obvious, but it may be that the concentration of CaCO3 in the Lake decreases quickly following the inflow and leaching of the freshet. Another striking feature of this picture is the horizontal variation: about a third of the way from the right-hand side of the picture, the white almost vanishes. This seems to be a consequence of the directionality of the waves which will wash up on rocks facing one way but not another. On the right of the picture, there are two lines, with a distinct gap between them. This probably is a result of the intermittent nature of waves. As the lake level is dropping there will be days when waves splash a good deal of water onto the rocks, and other days when the lake is calm. While the white line is clearly visible here, on closer examination it is not uniform across the rubble. Rock surfaces facing one way are coated; those facing another way are not. Again, this appears to result from the directionality of waves and suggests that the repeated wetting of the rocks by waves (and that water’s subsequent evaporation) is the primary mechanism leaving a residue of CaCO3 on the surface. This entry was posted in commentary, scenes. Bookmark the permalink. I’ve always wanted to know what caused this line! Thanks so much Alistair! Janene, I am delighted that others had also been curious about the cause of this local feature. Carol, you are correct that both happen. As the CaCO3 is subsaturated in the Lake, the rocks under water will be slowly cleaned as the CaCO3 on them is dissolved. And the initial draining of the waves off the rocks will likewise carry off some calcium carbonate. But, as the remaining water on the wave-wetted rocks dries through evaporation, even more crystals are added than have been dissolved and washed away. So, it is not as much that I hadn’t understood those nuances, but that I had chosen to stress the dominate behaviour. Could it be that below the seasonal flood line there is no lichen growth? Unless Im out to lunch there is little or no limestone in the local hills (some up past Meadow Cr). Although the Kootenay river has origins in the Rockies of course. If you check out some of the granite at the shoreline (eg at the bluffs across from the airport) the rock is pure, white granite. I think this has to do with the amount of feldspar in the metamorphic (not sedementary) rock. But I am no geologist! 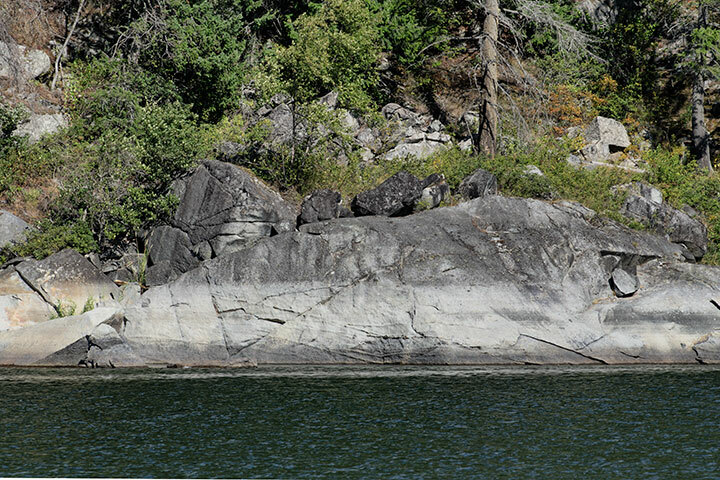 The darker, lichen-encrusted rock begins abruptly above high waterline. Steve, it is a pleasure to hear from you. Now, about your points: the plot thickens—it is likely that there is much more to be said on the topic of the white line. Yet, I don’t think that the white is merely a result of the absence of lichen on the previously flooded rock. That the white is a coating is clear from an examination of the many flood-covered bushes, such as the lakeshore willow bushes—they are, indeed, coated with a white substance. As to the CaCO3 content of the surrounding mountains, I must defer to others. I will get back to you on this. And yes, the the lichen-encrusted rock begins abruptly above the high waterline. But, is this because below this line the lichen was washed clean, or because it was covered by CaCO3? Steve, two sources assure me that there is considerable limestone in the surrounding hills. 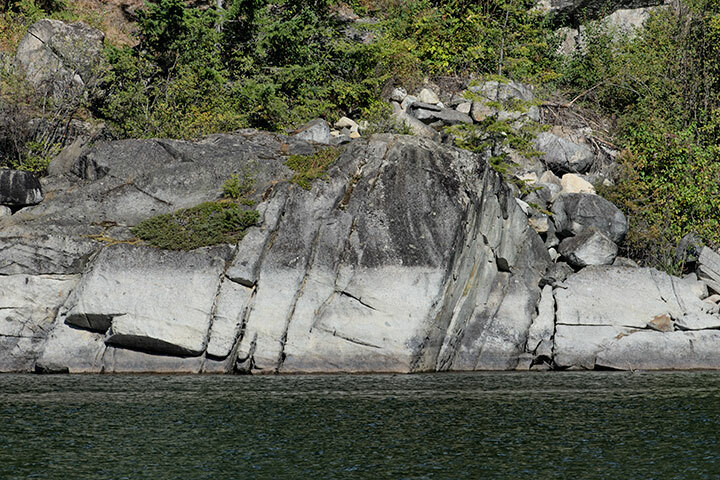 First, a Geotour for the West Kootenay, assures its readers that limestone (a mixture of various crystalline forms of CaCO3) is common in the Purcells (east of Main Lake) and on the eastern side of the Selkirks (west side of Main Lake), although it is less common in the western Selkirks. Further, Ian Bourne of Pure Solutions Water Treatment, tells me that most of the local water requires treatment for its calcium (and magnesium) content with the concentrations being greater for the groundwater (flowing into the Lake) than for the Lake itself (as would be expected). This is certainly consistent with the interpretation that the white line around the Lake is a deposite of calcium carbonate. There’s another white line issue down river from the sewage treatment plants in Nelson and Castlegar. The coating on the rocks, though whitish, has a fuzzy, textured appearance. I’ve heard it speculated that this is cellulose (wood fibre) from the toilet paper in the sewage. Maybe the really fine particles are too small to be screened out.